STOP and contact the call center if you have an EMERGENCY, SHORT NOTICE, NO RESPONSE, design, survey or topographical survey locate request to report. 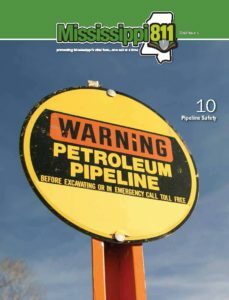 MS state law requires that an excavator submit a locate request: no less than 2 working days and no more than 10 working days, before excavating. Most Locate requests that are submitted online, between 7:00am and 4:00pm, Monday through Friday excluding observed holidays, will be processed by MS811 on the same business day. Requests submitted, after 4:00pm, Monday through Friday or on observed holidays will be processed on the next business day. Locate request tickets submitted online are not valid or complete until you receive email confirmation (in the form of the processed locate request ticket) from MS811. When reporting an excavation, you must provide accurate driving directions to the excavation site and accurate instructions as to where your excavation will take place to ensure that the correct member companies, who have reported utilities in the area, are notified. If you do not feel that you have accurate information, please gather the information before submitting your information to ensure everyone’s safety. We recommend visiting the excavation site to collect GPS coordinates. Supplying GPS coordinates along with accurate driving directions will help our agents quickly pin point the excavation site. Marking your proposed excavation in white paint or flags can help ensure that the correct area is marked by the utility owners to prevent a delay in your work. White is the color reserved for proposed excavation; using any other color may create confusion as to which utilities have been marked. Click on the appropriate button below to proceed. Click here if you will be submitting a locate request as a homeowner or individual. Click here if you will be submitting a locate request on the behalf of the company that you are employed by. Then signup or login to your Web Portal account.